Ritz crackers are go-to snacks for kids and adults alike. Personally, I couldn’t get enough of them as a kid. There are just so many things you can do with them. Whether you choose to eat these snacks with slices of cheese or munch on them straight from the sleeve, they never disappoint. I’ve always loved them with a smear of peanut butter. The versatility of a Ritz cracker doesn’t stop with what you can put on top of it, however. When you add these snacks to your pantry, the meal and dessert options are endless. Here are a few unique ways you can make these classics into new favorites. 1. Crushed Ritz crackers make the perfect topping for these gooey mac and cheese-stuffed shells. 2. Check out this salty take on another childhood favorite. 3. As if I didn’t love fried pickles enough already, I now know that I can use crackers as the crust. 4. You can enjoy this campfire snack all year long. 5. This is what’s for dinner tonight! 6. These mini peanut butter cheesecakes look divine. 7. Treat your kids to a Nutella banana bite. I promise they won’t be disappointed. 8. 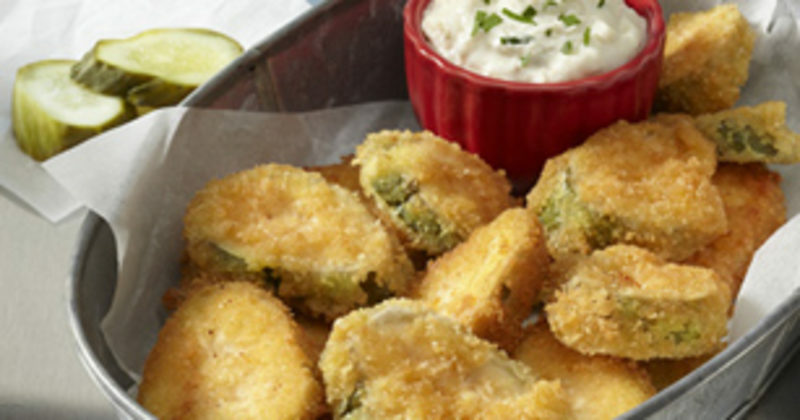 For a healthier option, try baked zucchini fries with a cracker crust. 9. These really do look delightful. 10. Cut down on the carbs with these mini cheeseburger sliders. 11. Cookie dough on a cracker sandwich. You’re welcome, world. 12. No need to go out to eat when you can make broccoli cheddar chicken instead. 13. Vidalia onion pie is everything that’s right in the world. 14. I bet you can’t eat just one mac and cheese cupcake. 15. I used to love making Ritz-filled toffee growing up. 16. For those watching their weight, this recipe calls for low-fat crackers. 17. Ritz-filled crab balls make the perfect appetizer for any event. 18. This salted caramel cheesecake looks almost too good to eat…almost. 19. The dipping sauce is inside the breading of this honey mustard chicken. 20. Combine chocolate, caramel, and crackers to make this awesome treat. 21. Everything tastes better wrapped in bacon.